With fewer hours of sunlight, colder temperatures, holiday shopping and a multitude of gatherings and celebrations, this time of year presents several challenges for staying on target with your running and general fitness routines. Instead of using this as an excuse to skip out on training all together, take it as an opportunity to change things up and add a little dimension and fun to your training schedule. Parties and celebrations are plentiful this time of year. This is also a great time of year to host a running event or 5K. Find one in your area or create one with your running group. It’s a healthy way to celebrate the holiday season and enjoy the company of your running friends. If holiday events have you strapped for time and you aren’t able to do the long distance running that you would normally enjoy. Start working on your speed with shorter tempo runs. If you’ve never done this before , here are some tips on how to get started. If you just can’t seem to find any time in your schedule to keep up with running and working out, utilize small increments of time throughout the day to perform simple exercises. This can be an effective way to maintain your strength and muscle balance until you are able to return to your normal routine. Look to some of our past blogs for exercise suggestions at home and work. Let us know some of your creative workouts! 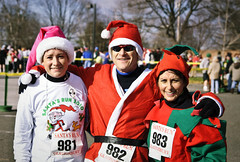 Happy Holidays from Baudry Therapy Center, looking forward to more happy, healthy running in 2012!